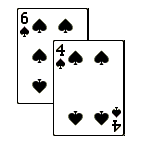 Euchre players traditionally keep score by using some of the remaining cards from the deck, typically the 6′s and 4′s. 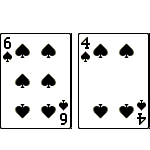 Each pip represents a point, and one card is used to cover the other so as to expose the number of pips corresponding to the team’s score. The score cards are placed at the corners of the table, and one partner is assigned to keep track of the score. The team that makes trump must take at least three tricks to earn points. 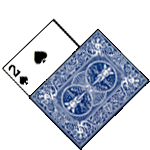 Failure to take at least three tricks is known as a Euchre, which earns points for the defendiers. 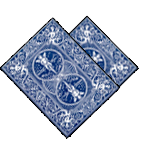 The first partnership to score 10 points wins the game. 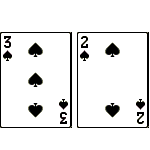 The player who chooses the trump suit by either accepting the up-card or declaring the suit in the second round of bidding may call “Going Alone” in order to score more points. 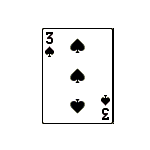 This means that their partner sits out of the hand and play continues with only three players. 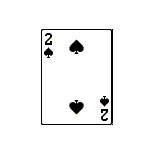 Once trump is made, the player to the dealer’s left begins play by leading a card. 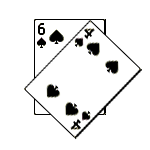 Any card may be led, and each player in clockwise order must follow suit. 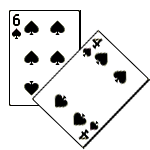 If a player cannot follow suit, then that player may play any card from their hand. The trick is won by the highest trump played. If no trumps are played, the trick is won by the highest card of the suit led. Please be aware, the left bower is considered a member of the trump suit and not a member of its native suit. 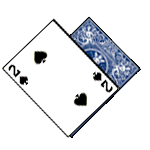 The player that wins the trick collects the played cards from the table and then leads the next trick. 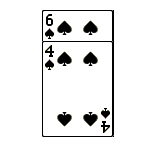 After all five tricks have been played, the hand is scored. 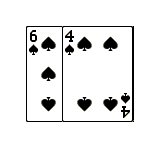 The player to the left of the previous dealer then deals the next hand, and the deal moves clockwise around the table until one partnership scores 10 points and wins the game. 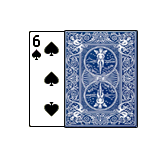 If all four players pass in the First Round of Bidding, the up-card is turned face down, and a second round of bidding will begin. Each player in turn has a chance to name a trump suit or pass. The suit named to be trump must be different than the suit of the up-card. 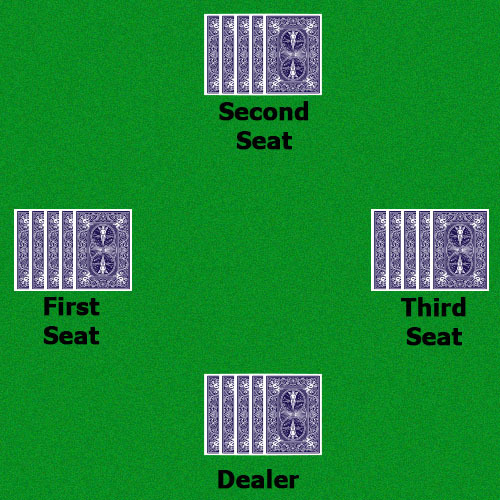 As soon as a trump is named, play will begin to the person sitting to the dealers left. 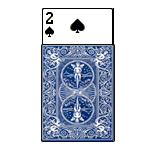 If all players pass in the second round of bidding, then it is a misdeal, and the deal is passed clockwise. 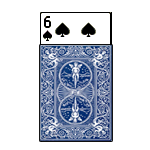 After the cards have been dealt and the top card of the kitty has been turned up, play starts to the person sitting to the dealer’s left. The up-card proposes the trump suit for that deal. It only becomes trump if one of the players accepts it. 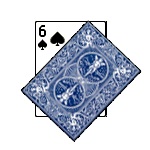 Each player in turn may accept the suit of the up-card to be trump by telling the dealer to “pick it up”, or they reject that suit to be trump by telling the dealer “pass”. 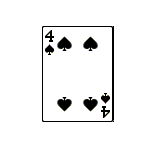 If a player accepts the suit of the up-card to be trump, the top card becomes part of the dealer’s hand, who then discards a card face down to return the hand to five cards. 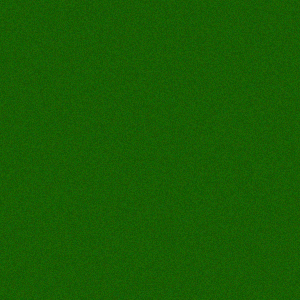 In which then, play will begin to the person sitting to the dealers left. 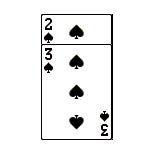 If all four players pass, the up-card is turned face down, and a Second Round of Bidding will begin. 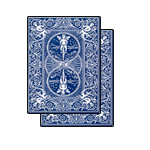 The four remaining cards will be placed face-down in front the dealer, and the top card is turned face up. 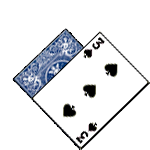 The stack of cards in front of the dealer is referred to as the kitty. 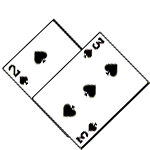 The card turned face-up is called the up-card.